As we in San Diego mount our second major effort in two years to establish a permanent public market, Tijuana already has a world-class example: the Mercado Miguel Hidalgo de Tijuana (Blvd. Sanchez Taboada and Ave. Independencia Tijuana Zona Rio). Opened at its current location in 1984, it’s a bustling, energetic and extremely colorful working market consisting of 80 open-air stalls arranged around a central courtyard and a Virgin of Guadalupe shrine. The Mercado’s stalls feature unbelievably fresh produce, dried chiles, spices, fresh moles, tortillas, a wholesale meat vendor and kitchen supplies, along with wonderful little restaurant options. 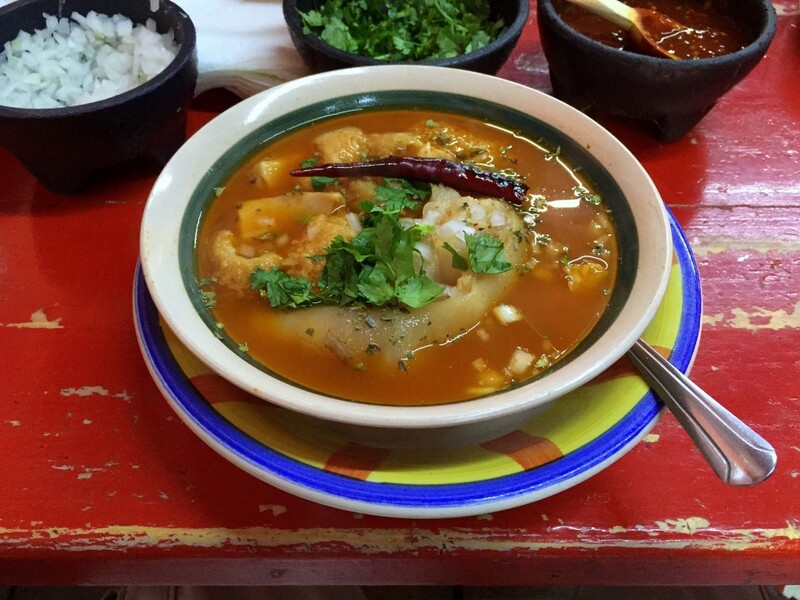 Perhaps the best of Mercado Hidalgo’s restaurants is El Rincon del Oso, home of a dish that was recently named Chowzter’s “Tastiest Soup in Latin America 2014” (nominated by San Diegan Scott Koenig). Hailing from Guadalajara, birria de chivo—a hangover cure of great repute—is a stew of goat meat, chiles, garlic, bay, Mexican oregano and sweet spices such as cinnamon, allspice and clove. While one might expect goat to taste gamey, it’s actually milder than lamb. The secret of the dish, however, is the combination of the sweet and hot spices as they play off against the rich broth. It’s both a hearty and heady brew. Another great option at Rincon del Oso—and another reported hangover cure (a theme appears to be developing here)—is the menudo rojo. It’s no accident that this dish features another protein that’s distinctly less than a fancy option. Menudo rojo is tripe and pig’s foot in a pork and chile broth, and it’s delicious. The restaurant’s food is not the stuff of Presidential dinners; rather, it’s cuisine that elevates the ordinary to the extraordinary. If you’re afraid of the tripe, go with the pozole, a similar dish featuring hominy (the same sort of corn used in grits). While chiles feature prominently in both the birria and menudo broth, neither cranks up the spice megawatts. For that, each table has a pot of absolutely nuclear salsa. Other condiments include toasted arbol chiles, finely diced white onion, fresh cilantro and Mexican oregano. If your morning after the night before doesn’t call for pig innards, maybe try Rincon del Osos’snopalitos and eggs. Nopalitos are the paddles of prickly pear cactus, diced or cut into batons. The nopalitos, which taste like a citrusy green bean with a texture more like okra, are sautéed with onion, bell pepper and tomatoes and cooked with scrambled egg just until the eggs curdle. It’s a good way to start any morning, hangover or not. Ultimately, though, there’s one thing that ties together every dish at Rincon del Oso: the superlative, piping-hot, yellow-corn tortillas. Not the machine-made hard discs in bags at the back end-cap of supermarket aisles, these are tortillas from freshly ground maize made on site and cooked on the flattop to a fluffy, deeply flavorful goodness. I’d always thought of tortillas as a wrapper. I had no idea how good they could taste. We in San Diego will eventually have our public market. Can we get a Rincon del Oso, too?